So I had some spare time this evening & decided to go ahead & have some fun with creating my Flickr Meme. 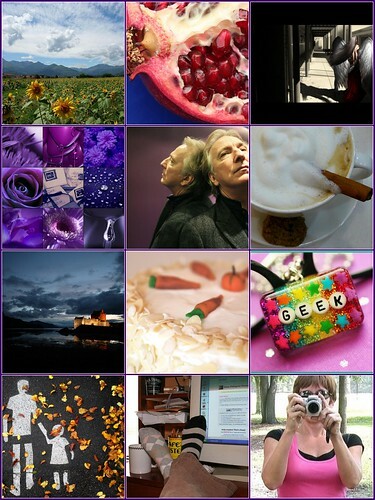 For those that haven’t seen them, they are a mosaic of pictures from Flickr. You search your answers to these questions on Flickr – and use pictures from the first page to represent the answer. So when I searched for “Angela”, I got a bunch of pictures of girls/women I don’t know… but I also got some cool photos by various photographers named Angela! 1. Biella Mountains and a Sunny Field, 2. Pomme de Granada, 3. Angel – Concentration Piece, 4. Pretty in Purple Mosaic, 5. Actor, 6. Coffee and cinnamon, 7. Welcome to Scotland, 8. Carrot Cake, 9. Super-Geek!, 10. Autumn walk, 11. Who died and made you sock police?12. Me!